Hundreds of legendary football players and coaches are immortalized in the College Football Hall of Fame, and now’s your chance to learn their stories! Discover what makes a champion, learn fascinating tales of the history of the game, and explore dozens of interactive displays. A memorable experience is waiting for you at the Hall of Fame in Atlanta. Scroll down to see how you can enjoy it to the fullest this year! Plus, make the most of your trip by requesting your free Travel Guide and exploring many additional attractions nearby! Your college football adventure begins when you step into the quad at the Hall of Fame building. Here, you can grab your tickets and gaze up at the three-story wall of football helmets. Over 700 teams are represented in this stunning display! The College Football Hall of Fame encompasses 50,000 square feet of artifacts and exhibits dedicated to the legends of the sport. You can interact with a 52-foot touchscreen wall, discover the history of the equipment players have used over the years, view trophies, and visit the Game Day Theater for a 4k feature film! Don’t forget to see what’s new at the rotating specialty exhibit, too. Of course, football fans can find their favorite players and coaches in the vast hall of inductees. Here, you can see the name of every member of the Hall of Fame and view displays and videos to discover what made them so great. Would you like to get a taste for what it’s like to play in the games? Walk through the tunnel and experience the indoor playing field and skill zone! See if you can kick a field goal, throw the football around, and test your agility on the obstacle course! It’s a favorite attraction among many visitors to the Hall of Fame. The College Football Hall of Fame hours are Sunday through Friday from 10:00 a.m. to 5:00 p.m. and Saturday from 9:00 a.m. to 6:00 p.m. Parking is available in the Green Deck on the corner of Baker Street and Marietta Street. If you find this lot full, try the Red Deck at the Georgia World Congress Center nearby. The ticket cost for the College Football Hall of Fame is $22 with discounts for children, seniors, and students. Active and retired military members can enjoy free admission. After an afternoon at the Hall of Fame, feel free to explore a variety of additional attractions nearby! Some of our recommendations include the Georgia Aquarium, Centennial Olympic Park, and World of Coca-Cola. When hunger strikes, try a meal at some of the top-rated restaurants in the area! If you want to be in attendance for potentially historic moments in college football, make plans to attend the SEC Championship Game in Atlanta! 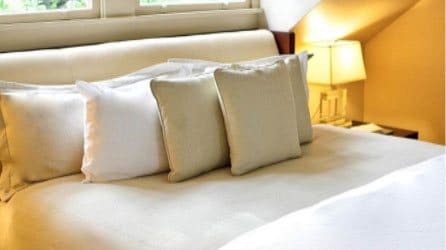 After your adventures in the city, we invite you to put your feet up and relax at our boutique bed and breakfast in Midtown Atlanta! Stonehurst Place is home to the most luxurious guest rooms and suites, making your trip the best it can be. Some of our amenities include gourmet breakfasts, heated bathroom floors, and Amazon Echo alarm clocks. For a cozy space to relax and rest up for another day in the city, we recommend The Eaves. You can set your bags down and lounge on your queen-size daybed, sit in your armchair and plan out your day, and gaze out through the picturesque windows. The experience you’ll enjoy at Stonehurst Place is second to none. Book your stay and get started! 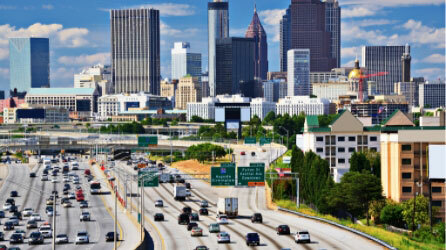 We look forward to welcoming you to Midtown Atlanta!